Cut the potatoes into long . Like the way we do for French fries. Do not cut too thin. Let it be bit thick. You can put them into water to avoid de coloration. 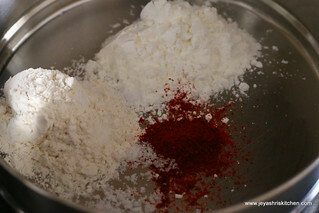 In a wide bowl add the red chili powder, maida, cornflour and salt. Drain the water from the potatoes and pat dry them. Mix this well with the powders in the bowl. 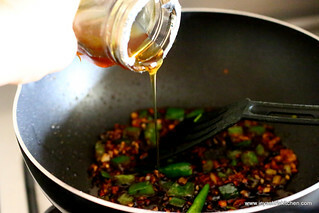 Heat the oil in a pan and when it is hot, slowly put the potatoes in oil. Do not crowd the pan, add in batches. 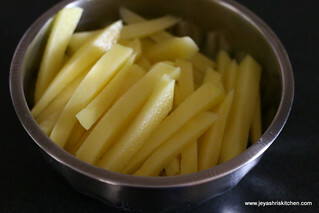 Ensure that the potatoes do not stick to each other while frying. Put the potatoes one by one. 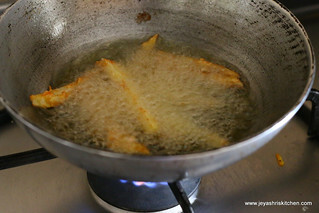 Fry till golden brown and drain the extra oil in the kitchen towel. Chop the garlic finely. Cut the capsicum into small cubes. 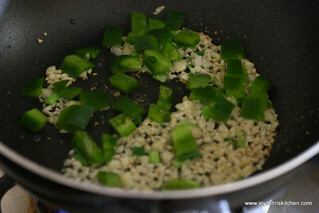 Chop the spring onion whites. 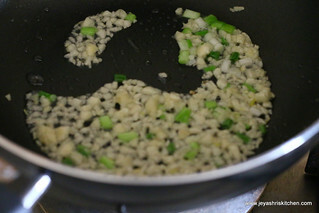 In a pan add 1 tbslp of oil and add the chopped garlic and the spring onion whites. 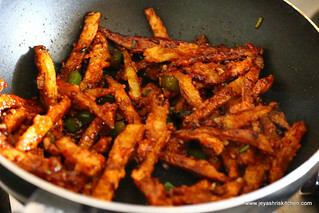 When they turn slightly golden brown, add the capsicum and saute for a minute. 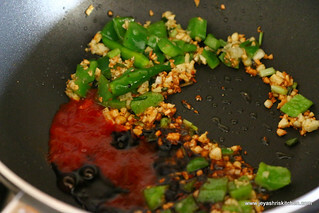 Add the 2 slit green chilis and cook for a minute. Add the soya sauce,pepper powder and tomato sauce. I used the ketchup. Discard the green chilis now. The flavour is enough. Now add in the deep fried potatoes. Gently toss it well and cook in a high flame to a minute . Careful not to burn it. 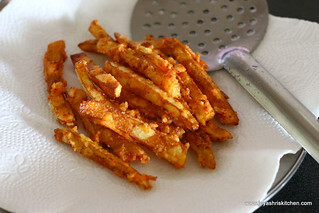 Cooking in high flame gives crunchiness to the potato. 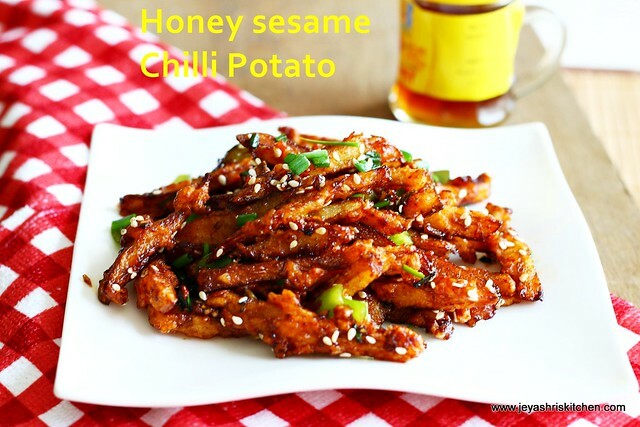 Garnish with sesame seeds and spring onion greens. This starter has to be served hot so that it will be crispy. Do not add water to the potato while mixing it with the powders. 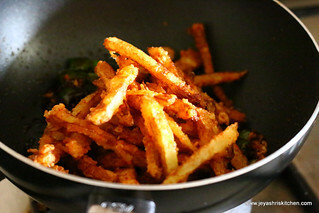 Always fry in batches and do not crowd the pan. 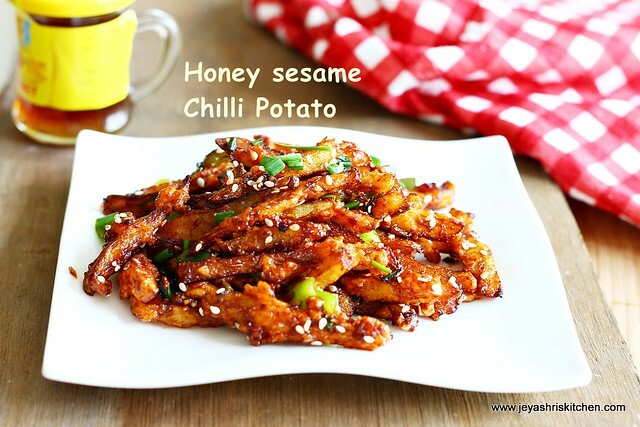 The tomato sauce and the honey brings down the spice of green chili and pepper . So don’t worry that it will be very spicy . Also it won’t be too sweet also. 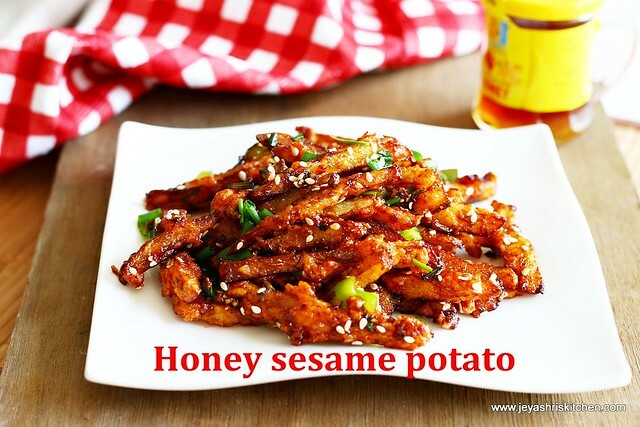 Sesame seeds gives crunchiness to the potato. No need to roast it. You can add as it is. 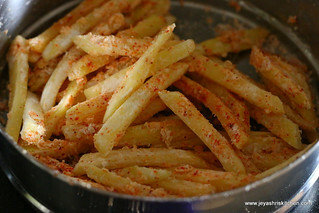 Adding rice flour to the powders will make it crispier. Add just 1 tblsp , if adding. Do not add more corn flour or maida than the quantity mentioned. Else it will become soggy. lipsmacking dish.. wat a color.. awesome jeyashri..
wow delicious resto replica dish.. yummy! !